The following is a letter from the organizing committee of “The Canadian” Event. The Canadian is sponsored by the Canadian Registry of the Tennessee Walking Horse. We know that everyone who supports the Registry cannot attend in person, but may wish to show their support of and participate in The Canadian Event. We invite you to read the following letter and Enter “The Canadian Event in a special division – I Want to be There with My Horse. The list of classes and the Entry form for I Want to be There with My Horse is attached. If you have any questions, please contact Dianne Little at [email protected]. I trust most of you have heard the buzz about the exciting new endeavor of the Canadian Registry of the Tennessee Walking Horse – “The Canadian Event”. For those with long memories, the last competitive and evaluative event sponsored by CRTWH was “The Canadian Futurity” in 2004. 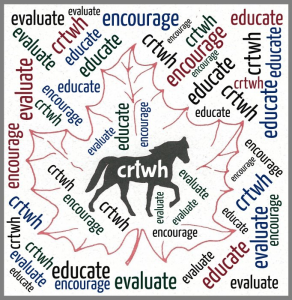 Fourteen years later CRTWH believes the time is right to sponsor an event that supports our Mission, Value and Vision and the principles of “The Canadian Triple Challenge”. “The Canadian Event” is unique – it is not a traditional or typical horse show. Classes include some elements of a traditional show, individual performance, written evaluation, fun activities, liberty, show and tell, as well as the newest trend in equine sports featuring the Stick Horse. Tack and Attire are relaxed but the emphasis on safety for horses and humans is of prime importance. In summary, this is unique in every way – not a show, but an Event. We invite all owners of Canadian registered horses to join us and participate in this new endeavor. We believe you and your horses would like to attend, but due to circumstances of distance or time or prior plans, can not join us in person for “The Canadian Event”. We want all Canadian members and their horses to have an opportunity to attend “The Canadian” Event. In the spirit of uniqueness, we have developed a unique way for you and your horses to attend. No matter where you live or the age of your horse or whether your horse is living or dead, you can participate in “The Canadian Event”. How can I participate when circumstances do not allow me to attend? We have added a new division” – Wish I Could Be There with my Horse and an Entry Form dedicated to this Division. Every Canadian Registered horse (living or deceased) is eligible to enter. For a minimum donation of $10, you can enter your horse in two classes of your choice. For a minimum donation of $20 you can enter 2 horses in a total of 5 classes of your choice. For a minimum donation of $25, you can enter any number of horses in a combined total of 8 classes of your choice. Each entry in Wish I Could Be There with my Horse will be assigned an entry number preceded by Wish. In every class the Wish I Could be There with my Horse entry will be recognized as the entries for every class are announced. Each entry in the Wish I Could Be There with my Horse division will be included on a Wish I Could Be There with my Horse display. If you submit a picture with your Wish I Could Be There with my Horse Entry, that picture will be included in the display. Each Entry in the Wish I Could be There with my horse will be entered in a draw for a special Award. How do I participate in the Wish I Could be There with my Horse division? Can I support The Canadian Event in another way? You can choose to show your support through donation either in dollars or product. All donations will be recognized during the show. You can sponsor an evening event for $50. You can choose the evening event, but choose early to get the event of your choice.